There are several ways to make a donation to St. Mary Church. 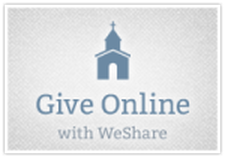 Offertory envelopes, electronic banking and online through our WeShare Program. Your contributions support the ministries, maintenance, parish outreach and organizations. You can support St. Mary by making a secure contribution online. PARENTS, this is an excellent way for us to minister to your Miami student! For more giving options, click HERE.